October is known to be marked by dramatic moves in the financial markets. This year the equity markets hit the skids in a big way. Except for Brazil, each and every country’s equity index was in the red. It's too early to tell if movement in the equity markets is simply the "October Effect," or if it marks the beginning of something new and unsettling. For years, investors have been hugely successful by sticking to the fundamentals and ignoring geopolitics, while the stock market "climbed a wall of worry." Now, uncertainty related to geopolitics may finally have taken hold of the investor psyche in the equity markets. The ongoing US/China trade war. China’s economy has yet to be fully impacted, but its economy grew by only 6.5 percent for Q3 y-o-y, setting its slowest pace since 2009.2 US tariffs imposed in late September and more tariffs due to be implemented in January could have a potentially significant impact. FX traders may test RMB7. Marching higher nearly every day for the last six months, the USDCNY rate currently trades at 6.9750 (Oct. 31), a gain of nearly 9 percent during that time.3 If China’s central bank chooses not to intervene in the FX market to prevent a weakening yuan beyond the RMB7 level, then traders will assume that a much higher dollar rate is acceptable and drive it up accordingly. We’re watching closely. The Italian budget increases odds of default. Italy submitted its 2019 spending budget to the European Commission, which promptly rejected it.4 Traders pushed Italian bond yields up nearly 40 basis points to 3.68 percent5, raising the chances of Italy defaulting on its sovereign debt. While the chance of Italy leaving the EU remains low, that turn of events would be catastrophic for the EU. Midterm US elections. A blue House and red Senate are the expected outcomes, which should have little effect on the currency markets. Any other result from the midterm elections would be largely unexpected, and could potentially unsettle the stock market and the dollar. Odds for a “no deal” Brexit are increasing. The UK is set to leave the EU on March 29, 2019. Current betting odds give a 40 percent chance6 that there will be a “no deal” or "hard" Brexit, meaning a transition without firm trade, customs, and regulatory measures in place. The S&P rating agency has come out with a warning that a long, albeit moderate recession in the UK would follow a "hard" Brexit. ECB and US Treasury withdrew liquidity. In early October and according to plan, the European Central Bank reduced its monthly net asset purchases (QE) to €15bn from €30bn, and plans to end the program altogether at year-end.7 In Q4, the US Treasury will borrow $425bn, the largest quarterly amount since 2009, and will issue a total of $1 trillion in 2018, as higher government spending and slack tax revenues push our budget deficit higher.8 Interest rates here and abroad are headed higher. Dramatic moves in financial markets can make protecting your business more complex. Leverage the expertise of SVB’s FX team, recently ranked by Bloomberg as the fourth most accurate FX forecaster in the world.4 Our highly skilled FX team can give you the information and ideas you need to protect and grow your international business in turbulent times. 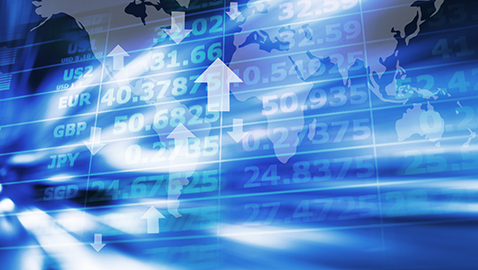 Learn How Currency Movement Can Affect Your Global Business. Read our China currency manipulation analysis. Explore all the tailored services SVB offers for your foreign exchange needs. Subscribe to our Daily FX Updates to have FX news delivered right to your inbox. Bloomberg Q3’ 2018 FX forecasters are ranked based on three criteria: margin of error, timing (for identical forecasts, earlier ones received more credit) and directional accuracy (movements with the currency’s overall direction). The rankings which were based on Bloomberg’s foreign exchange forecasts (FXFC), were for forecasters who provided forecasts for Q3’ 2018 in at least three of the four preceding quarters but no later than one month prior to September 30, 2018. Scores were calculated each quarter for the three criteria, which were weighted 60 percent, 30 percent and 10 percent, respectively. The final score for each currency pair was the time-weighted average of the four quarterly scores. The best overall forecasters were identified by averaging the individual scores for each firm on all 13 currency pairs and all four quarters. Forecasters had to be ranked in at least eight of the 13 pairs to qualify for the overall ranking (54 firms qualified). All ranking tables display the top 20 percent of the forecasters who were eligible, to a maximum of 10 names. This article is intended for US audiences only. The views expressed in this column are solely those of the author and do not reflect the views of SVB Financial Group, or Silicon Valley Bank, or any of its affiliates. This material, including without limitation the statistical information herein, is provided for informational purposes only. The material is based in part upon information from third-party sources that we believe to be reliable, but which has not been independently verified by us and, as such, we do not represent that the information is accurate or complete. The information should not be viewed as tax, investment, legal or other advice nor is it to be relied on in making an investment or other decisions. You should obtain relevant and specific professional advice before making any investment decision. Nothing relating to the material should be construed as a solicitation or offer, or recommendation, to acquire or dispose of any investment or to engage in any other transaction. Foreign exchange transactions can be highly risky, and losses may occur in short periods of time if there is an adverse movement of exchange rates. Exchange rates can be highly volatile and are impacted by numerous economic, political and social factors, as well as supply and demand and governmental intervention, control and adjustments. Investments in financial instruments carry significant risk, including the possible loss of the principal amount invested. Before entering any foreign exchange transaction, you should obtain advice from your own tax, financial, legal and other advisors, and only make investment decisions on the basis of your own objectives, experience and resources. Opinions expressed are our opinions as of the date of this content only. The material is based upon information which we consider reliable, but we do not represent that it is accurate or complete, and it should not be relied upon as such. Scott Petruska is Chief Currency Strategist and senior advisor for Silicon Valley Bank’s global financial services group, and is based in Boston, MA. He advises clients on currency and interest rate hedging strategies, and helps them with other aspects of global banking. He regularly writes blogs on topics covering the global financial markets, conducts client seminars and webinars, and speaks at regional financial conferences. Petruska has more than 30 years experience in the currency and interest rate markets, and has lived and worked in Boston, Chicago, New York City, Singapore and Tokyo. Prior to joining SVB in 2009, he worked at several large international financial institutions, including National Westminster Bank, Irving Trust, Bank of New York, State Street Bank and Commerce Bank. He has been an institutional trader, product developer, analyst, salesperson and advisor. Petruska has been awarded several professional designations, including the CFA (Chartered Financial Analyst), FRM (Financial Risk Manager) and CMT (Certified Market Technician). He earned his undergraduate degree in Finance & Banking from the University of Wisconsin.